The Jacksonville Jaguars will face the Philadelphia Eagles at Wembley Stadium this Sunday. Doug Pederson’s have struggled defensively in recent games and will want to shore up against a potent Jag’s line-up. For Doug Marrone’s men, four wins in their opening four games is no mean feat. Despite consecutive defeats in recent fixtures, Blake Bortle’s side spearheads our Jaguars vs Eagles predictions as the team with the strongest forecast to win. The Jags possess a superior rushing game, with the likes of Cody Kessler and T.J Yeldon leading the charge. Yet despite the abilities of those in the front line, the Jags have shown us enough defensive frailties to suggest that the Eagles will be able to challenge them come this Sunday. They possess an experienced quarterback in Carson Wentz, with the 25-year-old averaging over 250 yards per game. Combine his ability with the Eagle’s talented receivers, Nelson Agholor and Alshon Jeffery, and there are points in this game for Pederson’s side if they play their cards correctly. So, while we’ve made Bortle’s side our pick to win as part of the Jaguars vs Eagles predictions, we’re betting that it’ll be a challenging game for Marrone’s side with multiple attacking threats present in the Eagles team. The Jaguars playing in familiar territory in front of a large fan-base has persuaded our betting tipsters to wager in their favour. Granted, odds of 29/50 are risky, but with an in-form Blake Bortles leading the Jag’s attack, there is every chance that the Eagles could be in for another defeat. 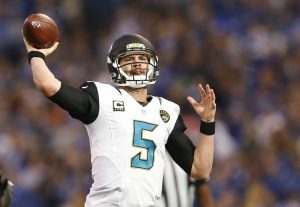 Bortles has impressed with his passing yardage, but also with his ability to move around in the pocket and create space for himself, posing as a threatening figure for Pederson’s defence. The first of our match bets in our Jaguars vs Eagles predictions forecast the 25-year-old to continue his form into this Sunday’s clash. Click here to read our NFL betting tips, covering all the best bets from this weekends action. While we do see Bortle’s team dominating the game, we’re still forecasting the Eagles to make a grand finish with a late flurry of points. The Jaguars have been quite intense in their first-half pressing and will pick up most of their points in this manner. 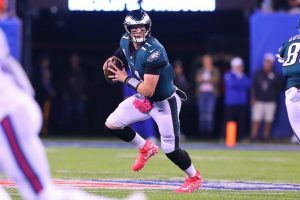 But given that Carson Wentz has impressed with the ball in hand in recent fixtures, it would be foolish to rule out his ability to bring last year’s Super Bowl winners back from the dead. Our traders don’t foresee them to end on the winning side, but certainly, expect them to make a game out of things at Wembley. The last installation of our Jaguars vs Eagles predictions and betting tips focuses on winning margins, with the Jag’s projected to emerge as victors by a country mile. A comfortable 20-7 victory over the Houston Texans which they cruised through proves that they are capable of blowing away teams and shutting out their opponents. Against Pederson’s team, while this may be a slightly wild bet to punt on considering that the Jag’s have impressed offensively, loopholes in their defensive formations suggest that there is a good chance of this latest bet coming true.